Beaulieu airfield on 4 March 1944, just after the 365th Fighter Group arrived. Royal Air Force Beaulieu or more simply RAF Beaulieu is a former Royal Air Force station in the New Forest, Hampshire, England. It was also known as Beaulieu airfield, Beaulieu aerodrome and USAAF Station AAF 408. 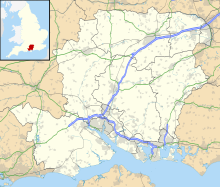 It is located next to the village of East Boldre, about 2 miles (3.2 km) west of the village of Beaulieu and 5 miles (8.0 km) east-northeast of Lymington. Opened on Saturday 8 August 1942, it was used by both the Royal Air Force and then later United States Army Air Forces. During the war it was used as a bomber and fighter airfield. After the war, it was used for experimental work before it was closed in 1959. Today the remains of the airfield are on heathland managed by the Forestry Commission. Areas of the old airfield are now designated as a flying area for model aircraft. Beaulieu was known as USAAF Station AAF 408 for security reasons by the USAAF during the war, and by which it was referred to instead of location. Its Pundit Code was "BL". Republic P-47D-28-RA Thunderbolt, AAF Ser. No. 42-28932, of the 388th Fighter Squadron. From 1 March 1944 Beaulieu airfield was made available for USAAF Ninth Air Force use. With the imminent arrival of more bomber groups in Essex the 365th Fighter Group was transferred from RAF Gosfield on the 5 and 6 March 1944. The 365th was a group of Ninth Air Force's 84th Fighter Wing, IX Tactical Air Command. The 365th Group began its move to Europe on 21 June 1944, the first squadron taking up residence at a temporary airfield Advanced Landing Ground A-7 Azeville, France on 26 June. Between the 16 and 26 of August the 323rd moved to Lessay airfield in France (A-20). In December 1944, the Airborne Forces Experimental Establishment (AFEE) moved to the airfield, where it remained for nearly six years using a variety of aircraft, including unusual ones such as the General Aircraft GAL.55 glider "Trixie" - the nickname bestowed from its Air Ministry Specification "TX.3/43", the Supermarine Type 322 "Dumbo", the Hafner Rotachute and Rotabuggy, and the Hamilcar X, along with various Handley Page Halifaxes used for supply-dropping experiments. The AFEE was involved in experimental work with glider towing and parachute drops, using the former East Boldre Airfield site on the far side of the Lymington-Beaulieu road as a drop zone. On 14 September 1950, AFEE was disbanded, and most of its equipment and personnel were transferred to the Aeroplane and Armament Experimental Establishment at RAF Boscombe Down. Helicopter training functions were transferred to RAF Andover. Beaulieu airfield was then without any flying units, placed under Care and Maintenance status, and then declared inactive. On 1 April 1953 control passed once again to the United States Air Force, and the facility was upgraded, but in the event no further flying units arrived. Finally, on 8 September 1955 Beaulieu airfield was handed back to the Air Ministry, in whose care it remained until November 1959 when it relinquished control of the land. Perimeter track at the west end of the 010 runway in 2007. With the facility released from military control, it once again became part of the New Forest Crown lands managed by the Forestry Commission. Half a century on from its use as a military airfield, the vast majority of the concreted areas of the airfield have been removed and returned to heathland, although the former locations of the runways along with the perimeter track are all clearly identifiable in aerial photography. A small section of the eastern end of the 27/09 main runway near the Lymington road is still concreted and used as a runway, pit and pilot control area for model aircraft. The connecting length of the eastern perimeter road is used as a cycle track. No buildings around the airfield area exist although the old water tower still stands to the north west of the airfield on Roundhill campsite, a Forestry Commission site which uses part of the old access roads of the airfield. Small parts of the former airfield are now covered with conifers. By means of permit to fly BMFA insurance is required, model aircraft are flown on a regular basis at this site. Visitors should be aware that dog walking and cycling is not permitted on the airfield and they should stick to the hard paths provided. The carpark next to the runway is for model flying parking only as posted on the sign posts. Model pilots will be found every day at the site, Sunday mornings being particularly popular. There are separate flying areas set aside for radio controlled flight and free flight. Flyers are required to adhere to the Beaulieu Model Flying Committee rules and to those of the Forestry Commission. ^ "Beaulieu III". Airfields of Britain Conservation Trust. Retrieved 2 June 2016. Dorr, Robert F., and Thomas D. Jones (2008). Hell Hawks! : The Untold Story of the American Fliers Who Savaged Hitler's Wehrmacht. St. Paul, MN: Zenith Press. ISBN 978-0-7603-2918-4. Wikimedia Commons has media related to RAF Beaulieu.